'Town Hall Party' was among the first of the country music shows to be seen on U.S. television, making its debut in early 1952 and running until early 1961. Staged every Saturday in a theatre in Compton, a suburb of Los Angeles, the stage was made up to look like an old barn, thus continuing the traditions of the various live shows that were first heard on the radio airwaves three decades earlier. 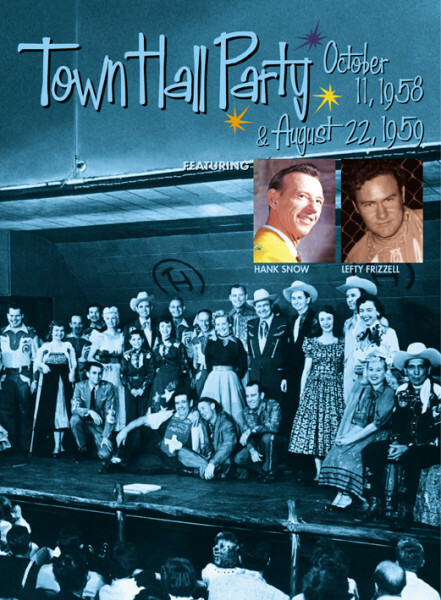 'Town Hall Party' was created with its own cast of regular performers and musicians, boasting a house that was virtually a 'who's who' of the West Coast scene comprising such as Joe Maphis, Merle Travis, Skeets McDonald, Johnny Bond and Tommy Duncan. Jay Stewart (who later hosted the TV quiz show 'Let's Make A Deal'), and Tex Ritter were the MCs. The weekly show presented an equally impressive guest list. Among the many guests to appear were Johnny Cash, Patsy Cline, Eddie Cochran, The Collins Kids, Freddie Hart, Wanda Jackson, George Jones, Merle Lindsay, Bob Luman, Carl Perkins, Jim Reeves, Marty Robbins, Hank Snow and Gene Vincent. -- Now 'Town Hall Party' is reborn on DVD. Launched in 2002, this continuing DVD series present both individual artists' performances, compiled from different appearances on 'Town Hall Party', and complete cast shows selected from specific dates. Completely remastered, and presented with full colour booklets, these releases fully captured the atmosphere, artistry and sounds of a bygone country music age. The Town Hall Party was one of the first country music shows to be broadcast on American television in early 1952 and ran until early 1961, coming every Saturday from a theater in Compton, a suburb of Los Angeles. The stage was set up like an old barn - this was supposed to convey the same atmosphere that had already prevailed three decades earlier at the live shows that had been broadcast on the radio. The show - with up to 2000 spectators in the hall - was initially broadcast live on the radio station KFI. However, the spread increased enormously when NBC took over the nationwide broadcast. And when television was switched on with KTTV-TV, the individual shows even lasted up to three hours. The popularity was so great that Columbia Records released the LP'Town Hall Party' in 1958 - with many performers who belonged to the tribe of the show. Our DVD series, launched in 2002, presents performances by individual artists from various'Town Hall' concerts; there are also complete Various Artists shows. Completely remastered and equipped with colorful booklets, these DVDs guarantee a perfect reproduction of the atmosphere, artistic skills and sound of a long gone era of country music. Customer evaluation for "At Town Hall Party Oct.1958 & Aug.1959 DVD(0)"